The Browning Hi-Power No bite Chamfered Hammer and CNC Machined sear 2 piece set contains our No Bite Hammer and CNC Machined Sear. 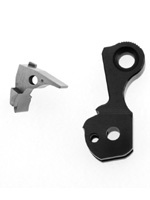 Both Parts are manufactured from our Special Tool Steel and heat treated to RC 50-53. Each Part is 100% inspected and checked for proper RC hardness.